You may recall how tortured I was (sort of) about making a Spencer for What Cheer Day, concerned that Spencers could not be documented to Rhode Island, let alone New England. I had the same worry about the Not-Quite-Good-Enough Coat. Things will come to those who wait, and what came this week was the long-awaited Proceedings of the Dublin Seminar for 2010, Dressing New England. In it I found an article by Alden O’Brien, Federal New England Fashion in the Diary of Sylvia Lewis. Sylvia Lewis [Tyler], Diary (1801-1831), MSS 2899 in the Americana Collection of the NSDAR provides the basis for O’Brien’s article and my joy. It begins routinely enough with my favorite stuff– spinning!– and carries on to knitting: stockings, mittens, gloves, a hat or two, and even “comforters,” or scarves. Shag, or thrummed, knitting is mentioned, so at least those of us interpreting the world of 1801 and later can be war. The real excitement comes on the third page: in the winter of 1803-1804, Sylvia Lewis cuts and sews a greatcoat. Then, in 1806, she makes a green Spencer, and in 1808, a black one. 1806 is still later than I wore my Spencer. They’re shown in fashion plates of the 1790s, and here’s a pattern, too: so they’re clearly worn in Europe earlier than 1806. The similarity between the French silk spencer at the Met and fashion plates gives me confidence that they are being made and worn in the 1790s and early years of the 19th century; Spencers are also mentioned in tailoring manuals of this period. 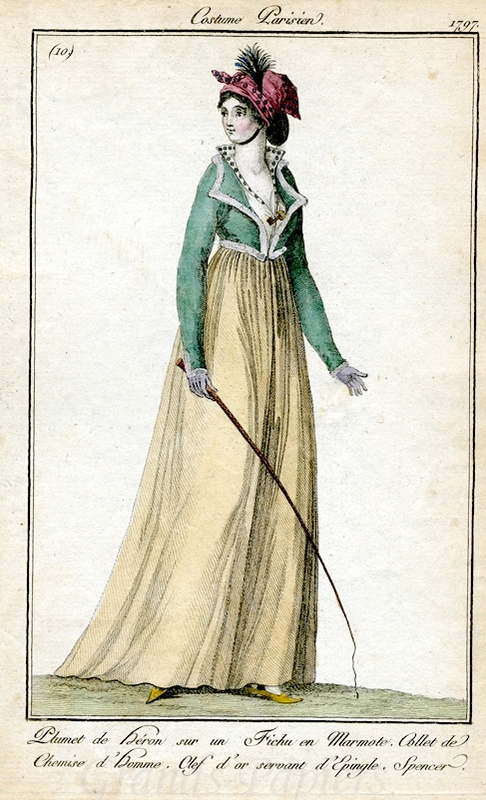 1797, with a similar shape to the Met’s French silk spencer. They’re placed in New England with written documentation, but how early are they here? And what did they look like? I know of one in a private collection which I am slavering to see, based on the description of the wool. The MFA has a few that seem to be local to Lexington, and there is one in Maine with a catalog record that shines with passive aggressive crankiness, and delights when compared to another in the same catalog. And no, I’m pretty confident that gentlemen did not wear spencers, or tailed spencers, at any time. But there’s really good stuff in Sylvia Lewis’s diary for anyone who wants to know more about clothing production, use, and costs in early Federal New England. Even if your Library doesn’t have it, your Librarian can get a copy of the article for you through ILL or you can buy the entire proceedings here. Just found your blog via Twitter, and will follow along with interest, particularly Rhode Island references and history. I believe I saw you at What Cheer Day. Really enjoyed the whole experience. Thanks for reading– I love RI, too! 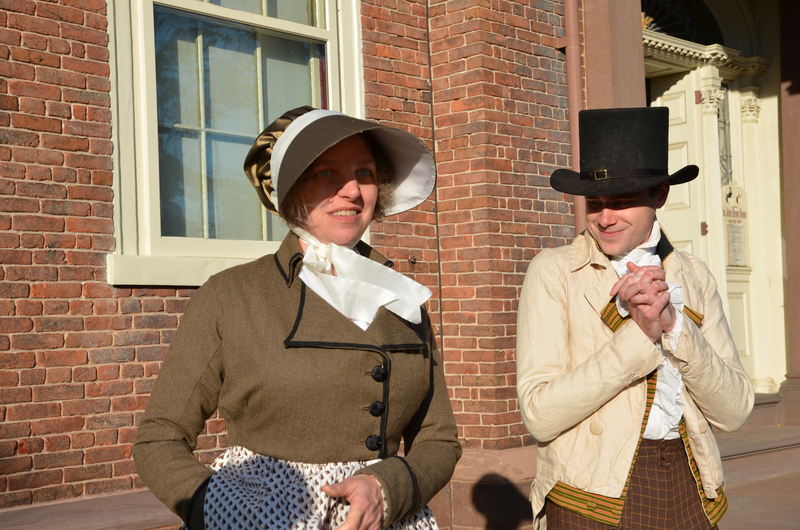 I patterned two spencers at Old Sturbridge Village! One late 1790s, one 1810s. Unfortunately neither had provenance attached, so they could have been bought abroad. Oh, fabulous! Will you be publishing them? It’s a shame they don’t have provenance. Ads in NE papers, mentions in diaries, extant items in local NE collections…it’s pretty compelling. I’ll have to find time to get to OSV.